During the spring of 2017 I was asked to paint some theater sets of the Children's Theater of Madison's production, 'Frog and Toad.' I enjoy these opportunities because they are very different than what I normally do, and provide me with a chance to learn very new and different techniques. 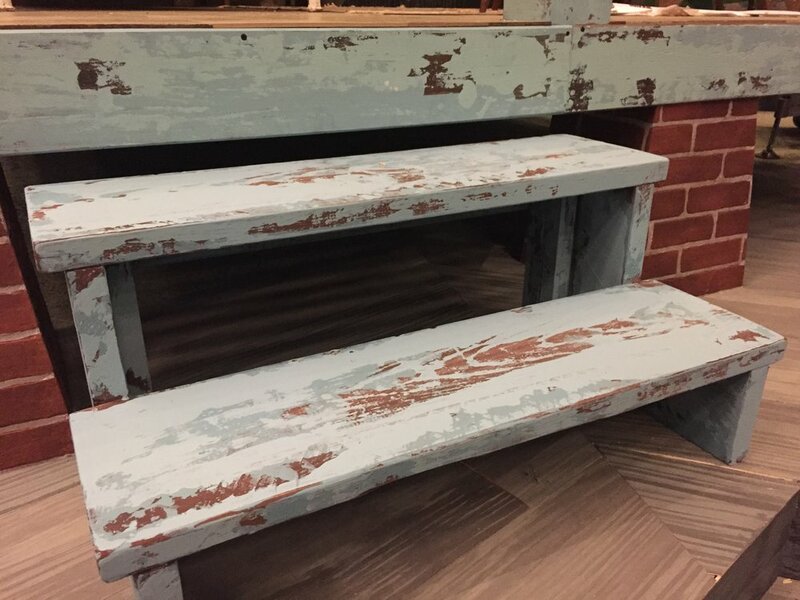 It's fascinating to get a behind-the-scenes look at how theater sets are made, and also to learn some of the faux finishing techniques used by scenic artists. One of the things that fascinated me about the approach of scenic artists is the variety of tools and techniques that they employ to get a desired effect. For instance, to get the look of sun bleached paint that is old and peeling off, we painted the base coat a dark brown (All paints used were latex house paints, thinned down with varying amounts of water and extender.) Once that dried we dipped a small block of wood in the blue paint and pushed it along the board, then repeated with a lighter color for the sun bleached look. For the rocks we glued styrofoam panels together and carved out the shape with a dremel. We then painted them with a variety of layers, glazes, and scumbles. For the wood grain, we painted the base coat and let it dry. We then painted on a thin, translucent layer of wood grain with a jagged 'comber' brush. Finally, we applied one last layer of that same color even more thinned down, to give the wood a more unified, less contrasty look. To get the floors to look like marble, we blended a base coat of 2 different colors, then soaked cheesecloth in watered down translucent white paint, and flung it onto the floor. We then did that a second time with a darker shade of white. Finally, we rearranged the tiles. Below is a shot of the wallpaper being painted. The Children's Theater rents out a warehouse where they build and paint all the sets for their productions. They also store props and parts of the sets from previous productions, including a giant dragon head. Below is the set, at the Overture Center, almost complete.